The Death’s Academy entrance exam for Midnight Smith is quickly approaching. There’s just one problem: Midnight is the worst exam taker the academy has ever seen. If Midnight wants to ever step foot inside the school, he’ll have to join forces with the hated Guardian Angels, and together face the deadliest creatures in the world—the dreaded Unicorns. Becoming a Grim Reaper has never been more hilarious! I want to thank Cedar Fort Publishing (Sweetwater Books) for sending me a copy of this book to read and review. Receiving this book for free has in no way altered my opinion or review. I have to say that I don't read all that much middle grade literature, although when I do I tend to love it. So when I was approached to review this book, and I read the synopsis of it, I thought it looked great and couldn't wait to dive into it. I was not disappointed in the least. Bast takes middle grade paranormal and makes it funny and charming. Think Harry Potter meets the Grimm Reaper! 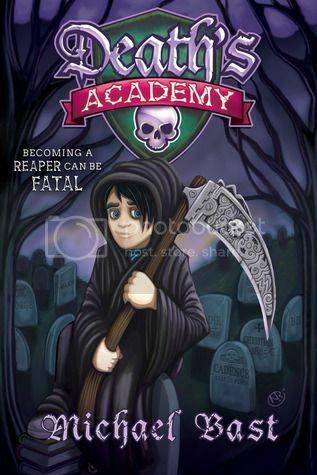 Midnight Smith is your average kid, if average is wanting to get into Death's Academy so he can become a reaper! But Night has one problem, he's not good at the tests used to get him in and he has no real way of studying for them. So, given the chance to go against the rules and try out some reaping on his own, he inevitably gets caught and starts getting himself into a lot of trouble. I love Night's voice in this book. He's a typical young kid who just wants to fit in. It doesn't help that his father has a "secret" past that has made him some kind of outcast. Every time Night's last name comes up in conversation people shy away from him. Everyone except his best friend Mal. She's quirky and un and really smart. And she doesn't care who Night is because in the end he's her friend, and has been forever. Mal and Night set out to "save the world" from an evil that lurks, which everyone else believes has gone extinct. So, when all the adults leave for the annual Reapless (a sort of vacation for Hoodies and Halos alike), it's not surprising that the world is attacked by the evil that lurks in the dark forest not far from Night's home. This book is full of action and adventure, and mostly clean humor (think 11 and 12 year old boy jokes and potty talk). I love how the kids interact with each other, and even with the adults. The book shows kids the consequences of breaking the rules. But it also shows them they should allow their voices to be heard; that sometimes adults really need to listen to what they have to say because it might just save the day. Kids, boys and girls alike, who love Harry Potter and Rick Riordan will dive right into this book and love it.